With more than 28 feet and counting this season, the skiing is in prime mid-winter form. To celebrate the recent blue skies and fantastic conditions, Snowbird is offering deals as deep as their snow. Special has a four night minimum and includes accommodations and Two Tram and Chair passes per night of stay. *Rates start at $156 per person per night (excluding the free 5th night) based on double occupancy at The Inn. This is a limited time offer for select dates and select room types. Rates do not include taxes or resort fee. Not all dates maybe available. 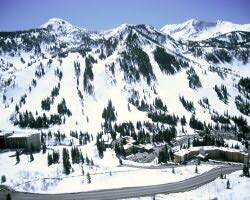 888-754-2167 and request the Ski free.Stay free package at Snowbird. And like the DEEP winter snow, hurry, this offer won't last long.